While the talk of the day generally seems to be restructure or improve productivity in the tourism sector, I have seen no new ideas on how that is to be done. Government officials and the Tourist Authority keep talking about finishing the Four seasons or Beachlands project or about expanding the port facility which means the focus will continue to be on the high end market, the same old path that has already reached its potential, and is a dead end therefore. Last year the Barbados Free Press picked up my story of 22 February 2012 where I said Barbados is a paradise lost if Barbadians don’t wake up to the fact that a whole new vision needs to be developed for tourism in Barbados, and that the middle class market was the future of tourism. The ideas below are my attempt to show the way forward. On February 25th, 2013, Dr. Delisle Worrell, Governor of Central Bank of Barbados, gave a speech “Keep pace with the competition” stressing that the tourism sector should improve its productivity. In this speech, Dr. Delisle Worrell was quoted as saying “ So long as our prices are right we can sell to our full capacity” thus avoiding empty hotel rooms due to overpricing, or leaving tourist dollars in their pockets due to under pricing. The idea that like the temperature of mama bear’s porridge, there is a price that is just right is erroneous. If the right price could be found, there wouldn’t be a 62 percent room occupancy rate over the year across the region, and the government entity NPHL wouldn’t be unhappy that the Hilton Hotel, a 4.5 star property, was depending too heavily on the lowest category room rate to fill its rooms. But the Hilton is correct for the management has obviously realized there are not enough rich persons, the so called one percent, to fill the rooms at over $300 US dollars per night in winter. What has amazed me is that so many hoteliers or guest house operators in Barbados maintain fixed seasonal daily rates even in the face of empty rooms. It seems as if the idea of providing weekly or monthly discount rate for tourists who will commit to a longer stay is not thought necessary here. Yet the airline industry has shown that a dynamic or variable pricing strategy over time is the means to a higher load factor with fewer empty seats. In economy class, a first rate is set which captures all those willing to pay that rate, after the rate is discounted for a time to catch the next income segment willing to afford that rate, and after returned to the higher rate to catch late-comers, then the rate is discounted further to fill more seats and the process is repeated again as needed. Surely the same strategy needs to be applied to the accommodation market here in Barbados. In my opinion the root of some of the difficulty in the tourism sector is that the government continues in the mistaken belief that because Barbados does not have capacity for mass tourism, it must focus on high-end tourism instead. If this idea was valid, the focus should be on building multiple Port Ferdinands all along the coast for the yachts of the rich, and on ignoring cruise ships altogether. After all, cruise ships mainly appeal to the middle class who travel on limited budgets. The middle class while large in numbers, must always decide between a short high end vacation or a longer more modest one. In the so called mass market which is really the middle class market, the value of the all-inclusive air and hotel vacation package is that it lets the middle class tourist know his fixed cost, and allows him to properly plan how to spend the remaining part of his budget outside of his vacation resort. Five hundred jobs at The Four Seasons Resort when it is completed, a resort aimed at the one percent rich, won’t put a significant dent in the unemployment in Barbados, nor will the building of multiple Four Seasons type resorts. Again, the Hilton has already realized that the one percent rich are not sufficient in number to make this strategy viable. But a focus on the middle class market because of their large numbers can, as long as there is a full range of accommodation– not just high end but mid range to modest with a product that gives the middle income tourist a reason to stay. I do not envisage large hotel resorts like in Cancun, but a myriad array of small to mid-size intimate hotels with one dozen to three dozen rooms woven into the community which collectively would employ thousands of workers. It should be recognized that the rich with their need for privacy and security tend to stay within their gated communities only venturing out occasionally for golf, a polo match, a high end restaurant or a shopping trip to Limegrove Centre. Moreover, a condo owner in the likes of Port Saint Charles or the future Four Seasons resort may only be present one or two months per year so that there is no additional spending of money into the economy in their absence. On the other hand, the middle income tourist will take the bus, rent a car, buy groceries, explore the rum bars and restaurants, shop for tourist souvenirs, and visit the tourist attractions. The sheer volume and turnover of middle income tourists through the year will ensure a sound tourist sector provided there is enough moderate and modest accommodation, and a variety of tourist attractions to ensure there is a reason to stay and return again and again. But for this to happen, more attention needs to be given to upgrading the tourist product. With the focus on high end tourism, the government has failed to both preserve and brand Barbados as a heritage gem. The National Trust House open-to-view program and the designation of the Garrison and the downtown as a UNESCO World Heritage site are embryonic start points and an indication only of the potential of the heritage niche. What could be done with the Garrison.? One only has to look at how the old Fort Henry in Kingston, Ontario, Canada is operated for an idea. Students are hired and act the part of soldiers dressed in the 1860’s period uniforms. They serve as museum guides and explain daily life in the barracks and dining halls which are furnished with period furniture and utensils. As a company of soldiers up to a hundred in strength, they demonstrate marching manoeuvres employed on the battlefield, demonstrate musketry drills and firing, and the drills and the firing of cannon. Of course, changing of the guard and sunset flag lowering ceremonies accompanied by military band and drum also form part of the display. So the Garrison too could be turned into a living museum. The Zoave changing of the noon guard I watched last year is the mere seed of what could be accomplished. But to turn the Garrison into a living museum, a holistic approach needs to be taken and the scale of the enterprise dramatically increased in size to turn the Garrison into a world class tourist attraction illustrating Barbados’ place in the history of the British Empire. If this vision is achieved, the adjoining George Washington and Barbados Museum would be guaranteed greater attendance and support as a spin -off of the Garrison project. In respect to the downtown, a cruise ship visitor walking down Broad Street sees expensive diamonds or emeralds marketed as duty free, T- shirts and other souvenir bric-a-brac and the mandatory rum for sale. A walk down Swan Street exposes the visitor to a lot of Chinese goods for sale. After passing Parliament and crossing the Careenage, the visitor comes to the Independence Arch and the Waterfront Café. With the limited scope and variety of attractions, the majority of day visitors conclude they have seen what Bridgetown has to offer and therefore see no reason to stay over or return. Isolated projects like the restoration of the Jewish Synagogue with its museum or George Washington House do little to enhance Barbados attractions precisely because these projects are done in isolation and not as part of a greater whole. By that I mean a holistic approach needs to be taken so that an entire area of the downtown needs to be restored and repositioned as a tourist attraction. To provide an idea of what might be done, I will tell you about my city, Ottawa, the capital of Canada. Below Parliament Hill, which is itself a tourist attraction with the daily tours of the Houses of Parliament, is an area known as Lower Town. There is a farmers’ market, but the small businesses there had fallen into decline or closed during the 1960s on account of the building of shopping malls on the fringes of the city that provided free parking and one stop shopping with their huge variety of stores. So a revitalization plan for Lower Town was undertaken with two main components. The first component was the establishment of hotels in or on the fringe of Lower Town to provide accommodation for the tourists wanting to see their capital city. As a result secondary businesses like restaurants, pubs, pastry shops, art galleries, souvenir and craft stores, night clubs and more sprang up in Lower Town to cater to tourist needs. The second component was the construction of new buildings or the conversion of old buildings to either office use or residential apartment use. The presence of permanent residents in the area and office workers from outside the area ensured that there was a permanent customer base for businesses in Lower Town. As a result secondary businesses like grocery or clothing and other stores sprang up to meet the daily needs of residents living there. The blended mix of tourist, resident and outside office worker restored the vitality of the area and brought about the start up of a wide variety of businesses that a tourist could browse and explore. In similar manner I envisage the transformation of downtown Bridgetown from Cheapside to St Michael’s and across the Careenage to the Empire Theatre. I see old warehouses on Cavan Lane or business buildings from Tudor to Roebuck Streets being converted into rental or condo apartments for residents and small hotels for tourists. I see the old wooden balconies and historic building being repaired. I see the creation of small shady courtyards being opened up by the removal of old buildings of no architectural value to create intimate dining or shopping spaces. With people living and working in the area and tourists staying in the web of small intimate hotels, I envisage a vibrant area with a wide variety of offerings and an ambiance that is so attractive that a day visitor from a cruise ship will want to come back and stay and explore Bridgetown and Barbados. I see large numbers of business and employment opportunities if a holistic approach is taken to transforming the downtown into a concentrated area of tourism attractions and working and living space. Development of the heritage market on an area basis would have broad appeal to the middle class income tourist. In the marketing of Barbados, luxury accommodation, shopping, and leisure time at the beautiful beaches or sport seem to be emphasized, while eco-tourism plays third fiddle at best. The government approach has been a mixture of neglect and missed recognition of the potential in marketing Barbados as an eco-paradise. How else can you explain the failure to create a national park of Graeme Hall mangrove swamp, or even a private -public partnership? The ocean access to the swamp has not been dredged and the sluice gate repaired so the swamp is cut off from the interchange of waters which keeps the mangrove swamp healthy. The National Trust walks are embryonic of what could be done to create a national trail system through the various micro-climates represented by savannah, gully, forest or seaside. Self-guided trails with paths marked, surfaces smoothed, steps and hand rails constructed for safety at dangerous points and a national trail map to the various walks need to be created. There are a number of land based attractions now. On my visits to Welchman Hall Gully and Andromeda gardens, I observed that as plants died and were replaced, the labelling was not updated so that the educational value of handouts was denigrated. The lack of caring and complacency applies to the Barbados Wildlife Reserve as well. The area in the Reserve just below the ticket office has a number of brick paths between a number of dry cement water channels and ponds that haven’t functioned for years. So this area below the tree canopy has been left basically barren of plants and animals for years. No thought has been given to taking up some of the brick and cement or opening up the tree canopy so light can allow plant and animal life to flourish again. Complacency begets a modus operandi that appears to be, if it doesn’t work, don’t fix it or change it to something that does work. There are a number of enterprises like the Wildlife Reserve, Welchman Hall Gully, Flower Forest, Hunte’s Garden, the Andromeda Gardens and Orchid World that operate in isolation from one another. No thought seems to have been given to linking them and marketing them together. For short stay and long stay visitors a passport ticket could be sold allowing the tourist to visit all attractions, or a half price passport ticket allowing the tourist to visit any three of the six attractions. To improve the product, all current eco-attractions need to be properly maintained and upgraded and new ones developed in order to give visitors a reason to stay in Barbados. And these land based attractions need to be marketed as a whole in a prominent way. My point is Barbados could be branded as an eco-paradise, a marketing strategy poorly and inadequately developed up till now. At present, too many day visitors from the cruise ships spend a day at the beach or visit Bathsheba and think to themselves, Barbados, been there, done that, I have seen what Barbados has to offer, no need to stay over or return. In terms of ocean activities, the marketing done by the Tourist Authority doesn’t seem to be much more than come and enjoy our beautiful beaches and friendly people, or swim with the turtles. At present, there are many businesses offering water based activities operating in isolation and for whom there is no coordinated marketing plan in respect to eco-tourism. While some dive companies are serious about providing genuine experiences in respect to marine reef life, some catamaran companies that offer swim with the turtle experiences are little more than lunch and rum parties to soca music with no genuine eco-tourist interest at all. The government of Barbados doesn’t seem to be that serious about eco-tourism either because I have in the past ten years seen fishing in the Folkstone Marine Park, the designated protected area of the ship wrecks in Carlisle Bay, and the unprotected Rockley Beach breakwater or reef which should be protected as an eco-tourism site for snorkelers. There should be real protected areas, not the lip-service given now for two reasons. First, there are potentially more tourist dollars to be had by protecting reef fish for eco-tourism than in harvesting fish for local consumption. Second, because of the easterly location of Barbados and the flow of ocean currents, there are not a lot of reef fish larva arriving from afar so that Barbados is more dependent on reef fish populations being regenerated locally from within the area. An enforced protected area would ensure the regeneration of fish populations for both the marine reserve area and for the areas that are fished outside of the reserve area as well. The ability to protect marine life is not simply a matter of money, for Belize, a poor country, has turned its reef system into a protected area that is enforced. Belize unlike Barbados has realized there is a large middle class market hungry for contact with the natural world not provided for by their city lives. The NCC is supposed to manage the beaches in support of water based activities whether leisure, sport or eco. But when I have visited the NCC managed parks like Folkstone, Brown’s Beach and Rockley, I have seen showers or toilets not in working order. Moreover, bench seats or picnic benches are in need of paint or repair or repositioning. It feels as if the grounds cleaners have a clause in their contract that says they do not have to pick up old beer bottles tops or tiny fragments of broken glass along with the paper, plastic or styrofoam litter. The other day at Worthing beach I showered off the salt water and sand but was then told sharply by the washroom attendant I could not enter or use the toilet before I had dried off. Sometimes it feels like the washroom cleaning staff are more concerned about minimizing their cleaning work than in providing service to the public. I do understand that some individuals whether Bajan or tourist can be thoughtless in bringing sand into the washroom, and need to be politely reminded. But by way of comparison, many shopping malls at home have their staff check the washroom condition on the hour, and clean up immediately where needed. But here the outdoor shower stalls themselves don’t seem to be cleaned more than once a day if at all for I have seen the shower floor coated in sand or litter that has blown in by wind. Both the condition of public park facilities and attitudes of many NCC staff are substandard and a disgrace, and in dire need of improvement if Barbados wants to be considered a most desirable tourist destination. When I reflect on some of the NCC staff attitudes and the Alexandra School situation or the LIME lay-offs, I think the unions here in “Little England” are like those in England before Margaret Thatcher trimmed union feathers and restructured the British economy. It was sad to see the demise of Ocean Park because it was of sound educational value for those who are not able to swim, snorkel or dive to enjoy some of what can be seen of the underwater world. It was unfortunate that a public-private partnership to save it wasn’t made. But the local customer base was inadequate to keep it open and the potential revenue producing middle income tourist market was and is not being targeted as the high end tourist market is favoured. At the end of the day, it is essential that government, businesses and individuals take preservation of the underwater life seriously so Barbados becomes known for the preservation of its reefs, and can market this eco-brand product to the world. And it is essential that the public beaches be maintained at a high standard in support of eco, leisure and sport tourism on the water. A few years ago while walking along some streets with very modest wooden homes, I noticed more than one home with an automobile that was no longer working. It appeared that the car had been run until it would no longer go so that its role was now to sit outside the house with a flat tire. To me it is quite astonishing that someone would buy an expensive car without thinking about the regular maintenance and repair costs needed to keep it roadworthy or without the financial means to keep it roadworthy. But then I began to notice the same lack maintenance to houses, hotels and other businesses. I wondered why a business owner would milk his property dry giving no thought to the businesses sustainability? But then I noticed even the government has allowed some of their buildings to fall into a ruined state. It became obvious to me that the way of thinking behind such behaviour explained why parts of Bridgetown have such an aura of decay. There needs to be a dramatic change in attitude and behaviour by many of the people in Barbados if the country is to upgrade its product image in order to become competitive. Here in Barbados it appears as if there are islands of excellently run businesses or resorts managed by forward thinking entrepreneurs in a sea of mediocrity or complacency in terms of maintenance standards or work efficiency. Recently, I saw in the newspaper a list of owners and their derelict homes which needed to be taken down and removed with the proviso that if action was not taken, the government would undertake to have it done, and the owners would be charged the expense incurred. I wondered if this rule should be applied to or why this rule has hasn’t been applied to derelict hotels as well? After all, why should the Caribbee or Sandy Bay hotels on the south coast or the Kings Beach Hotel on the west coast, as examples, be allowed to stand derelict or empty for years? Hotels like other businesses that collect taxes on behalf of the government but don’t forward them to the government are in my opinion engaging in theft of monies due to the people of Barbados. Legislation should be enacted so that there are options in the type of penalties that can be applied. If a hotel does not have the money to pay a fine for not having forwarded the hotel tax, then the option to apply a penalty in terms the equivalent value in land should be available. A penalty levied in the form of land along the beach front would help to create hotel properties that are set back from the beach by a strip of land at least 10 metres in width so that there is room for boardwalks and shrubs and shade trees along the entire coastline. And for property owners who fall into arrears and either cannot make payment or refuse payment of their annual property tax, the penalty of expropriation should be an option available to the government if it isn’t already. This legal process would begin to restructure the beaches and adjacent coastline for all Barbadians and tourists, ending the exclusive use of so much coastline by so few. 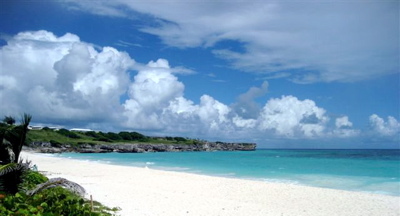 At present the ratio of public open beach area to hotel resort and private property area is much too small. These proposals which would allow the creation of more public beach areas may appear extreme, but they are no more extreme than the loss of coastline for public use that has been permitted over the years, the west coast. being a prime example. In terms of new resort development, no developments should be permitted on the seaward side where roads run close to the water. And where the coast road is distant from the ocean leaving a wide space for development, the new resort should be set back at least 10 metres from the beach again allowing room for boardwalks and shade trees and beautifying shrubbery. Restructuring the tourist industry should not just be given lip service. The proposals I have made above would ensure a rebalancing so that private property rights would no longer trump the common rights of the people to enjoy their own natural heritage. In this five part article, I have tried to show the potential of branding Barbados as an eco and heritage tourism paradise. It is not so much the generation of more air lift from different countries that is needed, but a holistic development and upgrading of the tourist product in the areas outlined which can draw in more tourists thus making the tourism sector more productive. As a tourist in my tenth yearly visit, my hope is that a discussion of these ideas will provide a stimulus to Barbadians to begin thinking seriously about how to reposition Barbados in the tourism market. Hopefully new ideas of where Barbados may go will arise. Barbados needs every taxi to be metered. We all know why. They are the first and last people that tourists interact with when they come to Barbados. No taxi should be more than ten years old and needs to be clean with aircon working perfectly. The drivers also need to make the effort with appearance and greating of passengers. On my last visit I was directed to my taxi as they have a system of which taxi picks up next. I got into a Nissan van with seats. The radio never worked and neither did the aircon. The driver looked like his wife had kicked him out and he had been sleeping in the van. From the airport to st peter he didn’t say a word. Not a thing. When I got out at where I was staying I felt like I had been run over. I took myself to the fishermans pub got a bottle of rum and sat there till all memory of the taxi had gone. I’m a regular visitor and so the point I’m making is that 1st and last impressions count. Taxi drivers are the first people that tourists meet and need to get there act together. If you start your holiday well you tend to have a good holiday. I hope my observation helps. I really like Douglas Edmondson suggestions and observations; and I agree with the observations from Anonymous. In addition, Barbadians need to look within ourselves and change what needs to be changed, rather than looking outward for what is pretty out there somewhere. The problem is with our way of thinking about what we are and how we are. We think of ourselves as not good enough, even though we say out loud that we and our country is the best in the world. This is not true, it is an illusion, and it is this illusion that keeps us stuck in the mediocre. We have to change our mindset and look to see what can be improved in a more (w)holistic way., and to do the hard work, in the hot sun, that we have to. .
Observations worth placing before the think tanks of The B.T.A., The Ministry of Tourism, The Chamber of Commerce, The Royal Barbados Police Force, and all parties with a vested interest. ESPECIALLY, THE FRONT-LINE PEOPLE!! Hopefully, deep, intense, serious/purposeful debate will ensue, and Barbados’ Tourism Market will be the beneficiary. PS: Do get the message out to the wider community! The “boys on the block”, “the boys on the beach”, “the boys in the city”. make them understand that many tourist save a bit of money each month until they can afford a trip. Tourist are not all rich! Part of what he says make sense. Adrian Loveridge wont like this. I am wondering Adrian Loveridge saw this? I agree with Anonymous that taxis in Barbados should be metered, as this would certainly eliminate the ‘charge as I please because they don’t know any better’ mentality of some taxi drivers on the island. During a recent visit to Barbados, I was charged BDS15 for a journey by one taxi driver and US$12 for the return journey by another taxi driver. When asked to explain the discrepancy in fares I was told that the first taxi driver had undercharged me. Guess what? All future taxi journeys around Barbados were provided by the taxi driver who had foolishly undercharged me. I have his card and will be using his services whenever I visit Barbados in future. Another point that taxi drivers in Barbados fail to consider is that visitors talk with each other on the beach, in hotels and at bars. One taxi driver was charging visitors different fares for the same airport to hotel journey. That taxi driver did not get any business for return journeys to the airport from those visitors who discovered that they had been overcharged on arrival in Barbados. Some will say that this type of practice is worldwide, which is certainly true. However, destinations that depend heavily on the tourist industry cannot afford the luxury of this type of practice. And to R Douglas Edmondson, Barbados (and other Caribbean islands) would benefit tremendously by implementing some, if not all, of the suggestions made in your article above. Barbados should never have been regarded as a playground for the rich and famous in the first instance. Real people live in Barbados, so why should it be labelled as a ‘playground’ for anyone. As I see it, Barbados has for too long depended on those who consider the island to be a ‘playground’. The time has come for Barbados to ‘get with the programme’ and realise that the island is considered by many to be too expensive. This was first brought to my attention at a property exhibition about five years ago, where just the mention of Barbados as an island in which to invest in property was met with “We can’t afford to buy property there”. The last Cricket World Cup did not see the numerous dollars expected due to greedy hoteliers doubling room rates. I have in the past recommended to private owners that they rent one bedroom in a two-bedroom apartment rather than turn away business. This has been implemented by some, but there are others who will not entertain this option. Barbados needs to realise that the world is changing every day and so are people trends. If the island does not act now, it may be too late. Personally I agree with many of the comments made, but its the implementation that we dismally fail with. Just to counteract the glib comments that Carson made. His hotel of course can dramatically reduce their published room rates and they were one of the chosen few that received (in his case) almost a $1 million in TIRF taxpayer subsidies. Our own room rates fairly reflect our costs of operation and investment without ANY Government subsidies. COME ON BARBADOS! YOU CAN DO THIS! This is a clip of Fort Henry’s sunset ceremony. I can’t imagine the draw you would get, especially from the cruise boats, but I think it would be sold out every night. Fort Henry is a living museum that features tours, restaurants, and displays. It also hosts concerts (Both military and civilian) and fine dining in a period officers mess. This would be such a winning formula for the base that I do not know where to start. As a fellow Canuck from Awfulwa, I have to say that this post is incredibly well thought out and written, and I hope that those in government will not only read this, but consider moving forward with most of the recommendations. Another area that would make a great heritage site and would be a good tie in with the Concorde Museum would be the Canadian Space Gun at Paragon Base. Currently it is located in the area that the Barabados Rifle Association uses for paintball, but even as that is by far my favourite paintball field in the world, bar none, I would love to see the gun and bunkers restored and preserved. Mr. Edmondson’s recommendations make sense. However I am sure that the “who he tink he is” attitude will prevail at the BTA, in the office of the Minister of Tourism and generally with the omniscient and arrogant cadre of people in Barbados who could bring about meaningful change, if only they could see beyond their noses. When tourism was all about Sun, Sea & Surf, Barbados never really had to sell itself; but with today’s new breed of tourists (eco-tourists), Barbados, with very limited natural resources, is at a lost; doesn’t quite know how to tap into this new market. St.Lucia, on the other hand, is doing quite well in this new market. There seems to be a disconnect within the tourism decision makers. Though, like I said the article clearly identifies what can be done, the acceptance of the ideas put forward and the execution of any implementation process is totally uncertain. Unfortunately things might get worse before anything is done to improve the Tourism Sector. Playground for the rich and famous image has definitely destroyed Bim as a preferred destination. The only thing the rich and famous offer when on the island is ugly, arrogant and dumb behavior that they know no one is willing to stop cause everyone is worshipping their millions, some of the stories would leave you physically ill……………there should be a significant change in how marketing of of the island’s tourism is done, including replacing the current implementers with people who actually know what they are doing, and cutting out the gouging. If fact many of the more successful hotels do NOT adopt fixed room rates. An example is Little Good Harbour who are currently marketing partially through Luxury Link and offering a 5 night package for TWO, including daily breakfast, dinner for two for one night, airport transfers, bottle of champagne on arrival and all taxes’service including 17.5 per cent VAT (on non accommodation element and 8.75 per cent on room) all for US$1012 or about US$200 a day. Wouldn’t this be good value for money in most island destinations who have to absorb high costs? Very relevant & well written article. Mr. Edmonton offers many pertinent suggestions however one thing he seemingly missed was the poor service standards most Bajans have vis-a-vis other Caribbean destinations. Bajans seem to think (honestly believe) that Barbados is the premiere place to visit & have become complacent over the years with this attitude, even with tourist numbers falling. A national groundwork strategy, established by the BTA & in collaboration with hoteliers & those in the restaurant\bar sector is also what’s needed to compete with the likes of Jamaica, Cuba, Dom. Republic, Mexico & other Caribbean locales. If not, my strong belief is that things will only get worse before they get better. Sound thinking outside of the box, sadly lacking in Barbados. Employ this man immediately as consultant to the Ministry of Tourism, disband the BTA and pay him their combined salaries. @ Inkwell – Employ this man immediately as consultant to the Ministry of Tourism, disband the BTA and pay him their combined salaries. Bajans need to learn how to play the Tourist Game. The Jamaicans smile & laugh & you gladly give them your money. It is a mutually pleasant experience. Likewise in other West Indian Islands. In Bim they are rude & surly & expect you to enjoy the experience. They argue in front of guests & generally give the impression that you are bothering them. Bajans need to get off their high horses . How is it that proud Jamaicans have mastered this industry & Barbados “the Jewel of the Caribbean ” is still lagging? This culture of “casual indifference” may be tolerated by the locals, but people that have worked hard for a vacation may expect at least a bit of common courtesy from a destination that markets itself as a Luxury/VIP Resort. Redman’s comment is very accurate. He hit the nail right squarely on the head. I’m happy that others have noticed the same thing. Again, I maintain that Bajans have become far too complacent (with their attitudes towards tourists) & should realize that people will ‘vote with their feet’ & visit other destinations if they aren’t treated with (at the very least) a smile & a genuine Thank You. Your comments may be accurate in general, but there is at least one exception to the rule. We spent a week at The Crane in March, and the service was superb. Everyone with whom we had contact, from the person at the reception desk. to the servers in the restaurants, to the housekeeping folks, to the gardeners raking the leaves on the grounds, and the IT guy who came to the room to help me with a problem with my laptop(within 5 minutes of my request) was friendly, welcoming and helpful. We will return to The Crane and recommend The Crane to friends and acquaintances. That Canadian Paul Doyle and his staff sure have mastered the Tourist Game. But do not talk about the prices.!!! I am very pleased to hear your comment, Loves Bim. I have heard nothing but great comments about The Crane. Happy to hear that Mr Doyle seems to perhaps be implementing more Canadian/North American service standards to his staff (I believe Doyle is a Canadian). My point was that in general the service standards are lower in Barbados than in North America & Canadians & Americans are used to getting better, more friendly service than they receive in Bim. Perhaps this is too much to expect as Barbados is an island culture & people have their own ways (& take their own time) in doing things. Would be interested to hear other comments about this. I don’t believe I’m wrong here & I certainly mean no disrespect; simply stating an opinion from someone who has traveled a lot. Barbados and heritage do NOT go together! History in Bim is seen as all about race. I’m seeing loads of accolades like the above about the Crane that look very suspiciously like somebody was put up to singing its praises. I know they did one such scam on tripadvisor. What’s the deal Luvs Bim?